Well-crafted sushi, sashimi and small plates in a stylish environment. About the décor: A dimly lit, romantic ambience and a large sushi bar that offers comfortable seating along with community tables and couples tables set the stage for contemporary Japanese cuisine. An upstairs rooftop environment provides a view of Midtown, but is not available to wheelchair patrons. Likes: The presentation artistry and wide range of small plates enhance the contemporary Japanese dining experience. Dislikes: A dessert menu that doesn't list prices, and dessert prices that hit the roof when you get your tab. Plus stemless flutes for sparkling wine --- so dated. 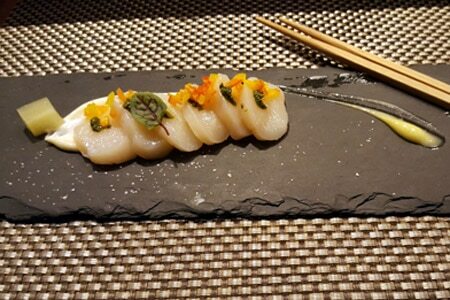 Food & Drinks: Start with the scallop carpaccio, carefully plated with a smear of lemon aïoli and a tiny square of yuzu gelée. One may make a meal from an assembly of these small plates. Check out the nigiri sushi and sashimi, which may be ordered aburi style (lightly seared) for a slight upcharge. Specialty nigiri include "Kani truffle," for which a strip of crab meat is topped with truffle butter and pesto in an elegantly simple arrangement. For a substantial dish, consider the sweet-soy-glazed short ribs that are, we're delighted to report, cooked on the bone. Paired with a splash of root vegetable purée and sautéed greens, the generous portion is tender and satisfying. House-made panna cotta is among the desserts. While it was nicely done and presented, the price tag (not given on the dessert menu) was pure sticker shock at $12. A glass of bubbly does well with the appetizers and sushi/sashimi, but it's served in a stemless flute; insist on a white wine glass. The wine list has a good number of fine selections by the glass, and there’s ample saké choices and cocktails.